Wandoan is a small town in Queensland, about 400 kilometres west of Brisbane, half way between Taroom and Miles. It services the surrounding cattle and wheat industries. 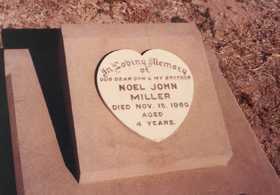 The earliest burial in the cemetery is that of Lawrence John Alfred Harris, who was accidentally killed on 17 October 1960. This transcription was completed in September 2000 and is a terrific genealogy tool for anyone exploring their family history or building a family tree.